Honus Wagner is one of the greatest shortstop of all time and owning one of this card is every baseball card collector's dream. Today, after having numerous myth's printed, advanced collectors acknowledge that Wagner's insistence to be paid for the use of his image by the tobacco companies caused his card to be withdrawn from the market. In the 1980's, during an interview with Wagner's granddaughter, she felt that his grandfather simply did not want to see children buying cigarettes just to get a picture of him. Would Wagner's card have been withdrawn and if it hadn't been, would the card be such a sought after collector's piece today. No matter why this card was withdrawn from the early print run, it is always the centerpiece of any auctions. Since 1910, there are only about 50 or 60 examples have surfaced and few exist in high-grade condition. In the very first baseball card catalog published in the 1930's, The American Card Catalogue, listed a value of $50 for the famous Honus Wagner card, making it by far the most expensive of all cards even then. In the same catalogue, all the other cards from the T206 set were listing a value of 35 cents each. 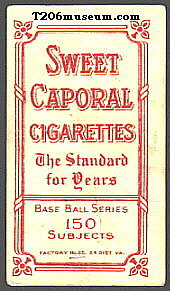 Majority of T206 Honus Wagner have Sweet Caporal 150 Series Factory 25 back and a handful of them have Sweet Caporal 150 Series Factory 30 advertisements. 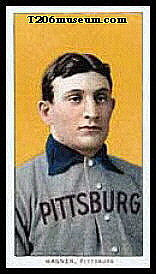 There are three Honus Wagner known to have Piedmont 150 Series Factory 25 back. There are approximately 50 to 60 examples known to exist and only 3 with Piedmont backing.